La Serna High School English teacher Shelly DeSimone’s dream to be an English instructor began in second grade when a teacher asked her to help a struggling English learner. The joy she felt when her classmate completed the year fluent in English inspired DeSimone to dedicate her life to ensuring equity to English learners. 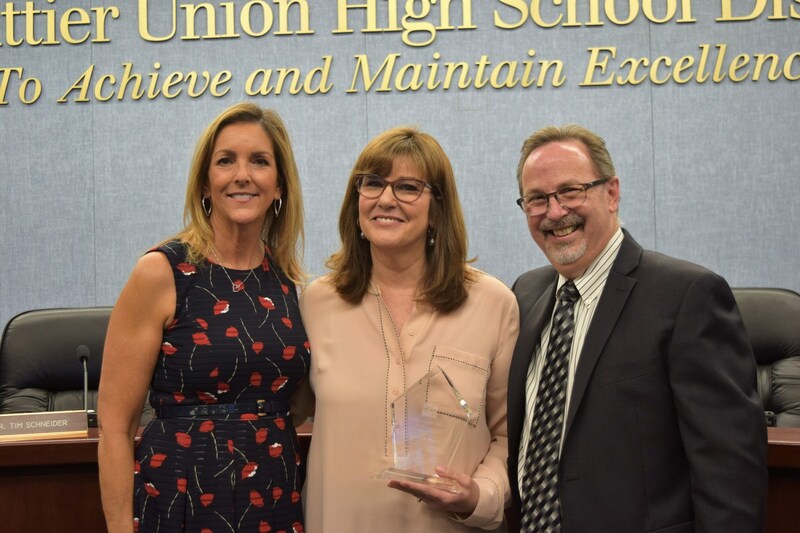 Over 34 years at La Serna, DeSimone has helped hundreds of English language development (ELD) students to speak, read and write English, guided La Serna’s Puente Program since its inception and established herself as an author of teen fiction for English learners. 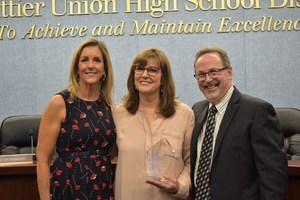 For DeSimone’s commitment to preparing English learners for college, she was named Whittier Union’s 2018-19 Teacher of the Year. DeSimone teaches English Advanced Placement and Honors classes and was La Serna’s newspaper and yearbook adviser for nearly 20 years. But her passion remains the Puente Program, a rigorous interdisciplinary college prep program that focuses on increasing the number of students who enroll in a four-year university. DeSimone was a founding member of La Serna’s Puente cohort. DeSimone’s contributions to English language development go well beyond her classroom. Seeing a need for more reading material geared toward teenagers with limited English skills, DeSimone wrote “Paulo’s Wall,” which was published in 2002 by Perfection Learning and is used in schools across the United States. DeSimone has also published several children’s short stories and, in her spare time, writes museum exhibit text. DeSimone’s work can be seen on reader rails at the George H.W. Bush Presidential Museum and Carbon Canyon Regional Park in Brea.